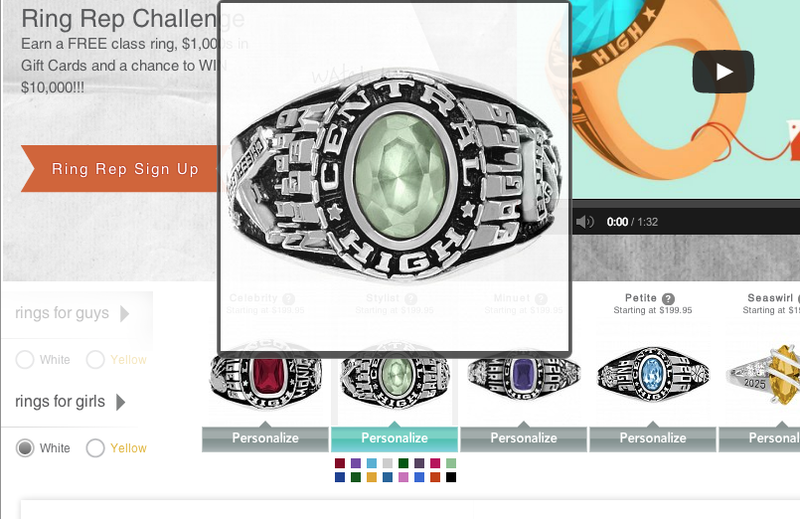 So, you want to design a class ring? Cool. We thought we’d take a bit of time to create the definitive guide on the ins and outs of building your own personalized ring online. Building your own ring can be confusing, time consuming and frustrating. That’s why we want to help prepare you for building your ring to make the entire ring experience go smoothly and be more enjoyable. Let’s take a minute to set the stage. First of all, why do you want to create your ring online? We believe there are several advantages to building your ring online vs. buying it in school. 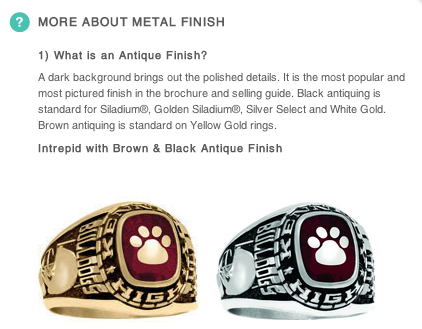 Convenience – Typically, class ring sales go something like this. A class ring sales representative comes to your school at an appointed time during the year. Maybe you have an assembly and he gives his sales pitch. Maybe you watch a video. But in the end, you leave with a brochure in your hand, and he comes back a week later to take your order. There’s not a whole lot of time of flexibility for you to choose the ring you want and/or shop around. 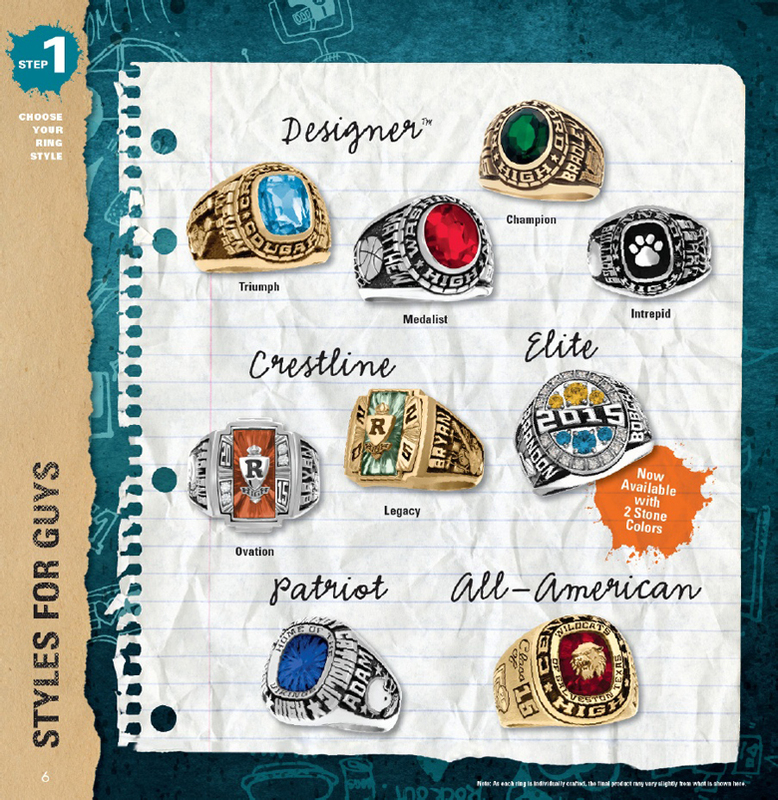 Isn’t it time to take another look at how we buy our class rings? Yes! Seriously, it’s 2013. Building your ring online allows you the opportunity to check out class rings any time and anywhere you want. Buying your ring is a big deal. It should conveniently fit around your life. Price – The major ring companies who come into the schools are Jostens, Balfour and Herff Jones. Ever played a game called Monopoly? When you only have one vendor choice to buy your class ring, prices tend to go up. Buying your class ring online gives you the opportunity to price shop and get the right ring for the right price. Selection – Kind of the same idea here. Maybe you don’t want to be locked into the ring styles, designs and choices of the ring company who comes to your school. Building your ring online allows you the benefit of a wider selection when you shop different websites. You can find the ring that perfectly fits your unique style. Timing – Most ring companies will come to your school during your sophomore year. The idea is that you’ll wear your class ring for your Junior and Senior year in high school (and maybe beyond high school). Well, there are all sorts of reasons why you might now have wanted a class ring when you were a sophomore. Or, maybe you were sick or on vacation when the sales rep came to school. Maybe cash is a bit tight in the family right now. 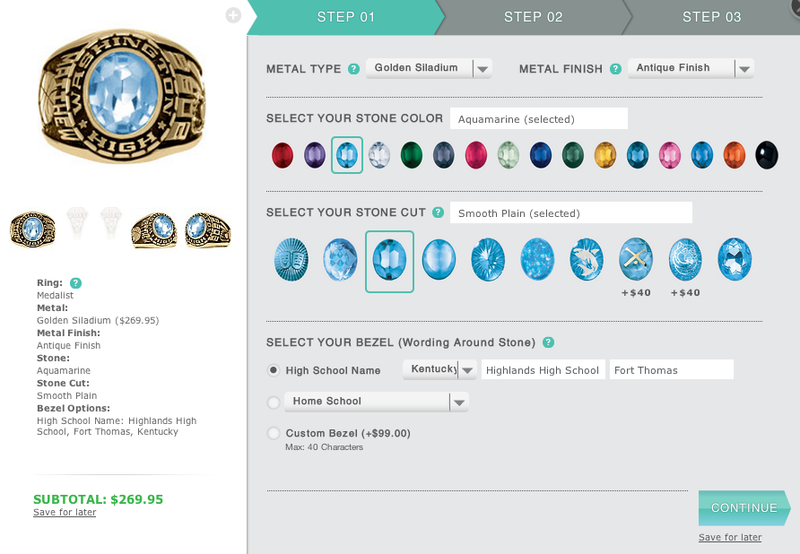 No matter the reason, shopping online for your class ring allows you the opportunity to build your personalized ring whenever you want. Visualization – When you are building your ring from a paper brochure, it’s hard to get a feel for what it will look like. Yes, there are different pictures, but you have to imagine in your head what it will all look like pieced together. 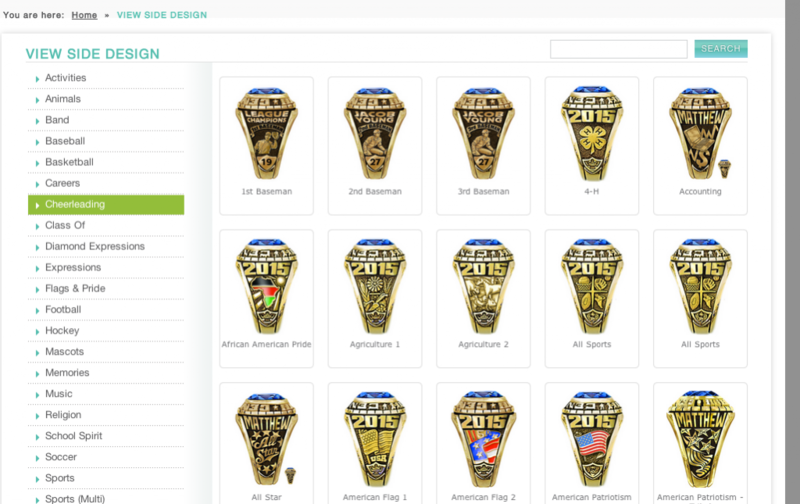 However, when you built a your ring online (depending on the website), you can view metal color, stone color, side emblem personalization and engraving options all right there on the screen. So, you have a strong idea of what your ring will look like before even purchasing. Less Overwhelming – When you are handed a 20 page packet of material in person, it can all be a bit overwhelming. There are lots of steps to go through, and it’s hard to organize it all. However, when you are building a ring online (again, depending on the site), the information can be less daunting as your ring building is broken down into different steps. One area this makes a huge difference in is when you are choosing your personalized side emblems. In a brochure, it’s overwhelming to see hundreds of emblems staring you in the face. 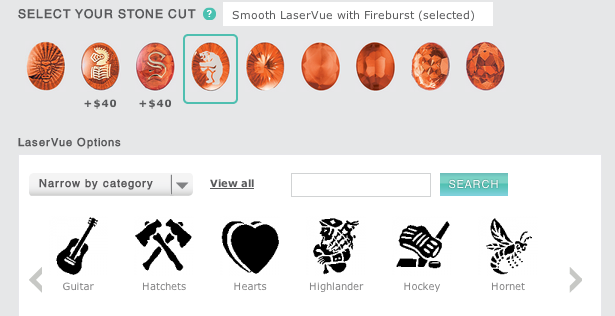 Online, you can sort the emblems by category and more easily choose the design that is right for you. Get a Free Ring – Huh? Whad’ya say? Yeah, you heard us right. With our Ring Rep Challenge, refer a few friends our way, and you can save major $$$ on your ring, or even get a free class ring. You can also win $100 gift cards or even $10,000. Not a bad deal, right? 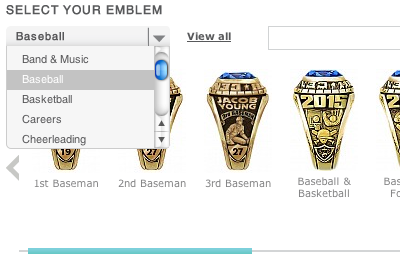 Just one more reason you might want to design your class ring online. Now that we’ve covered the major reasons WHY someone would get their custom class ring online, now let’s look at what the actual experience might be like. 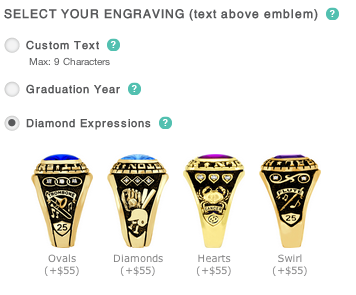 Since you can design a class ring on our website, we’ll focus primarily what it looks like on WearMyStory.com. 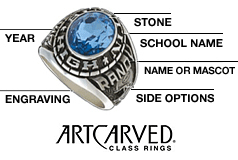 We offer ArtCarved class rings. ArtCarved (a sister company to Balfour) is one of the most respected names in jewelry today. Founded in New York in 1850, ArtCarved began as a manufacturer of high-quality and uniquely styled wedding bands and engagement rings. They first entered the class ring business in 1920, bringing to it their expertise as makers of fine gold and platinum jewelry. Since that time, ArtCarved has emerged as the class ring industry innovator, bringing more new styles, features and options to high school students. Besides our revolutionary Ring Rep program that allows students to earn a free class ring, one of our main goals was to create the most user friendly website available for creating your ring. As we were shopping a lot of the different class ring sites that exist, we found ourselves being frustrated … a lot. We found sites where the pricing was not upfront, and so you could waste 15 minutes building your ring and then find out it was waayyyy out of your price range. We found sites where the navigation was horrible. We found many general jewelry sites that had class rings as a category. 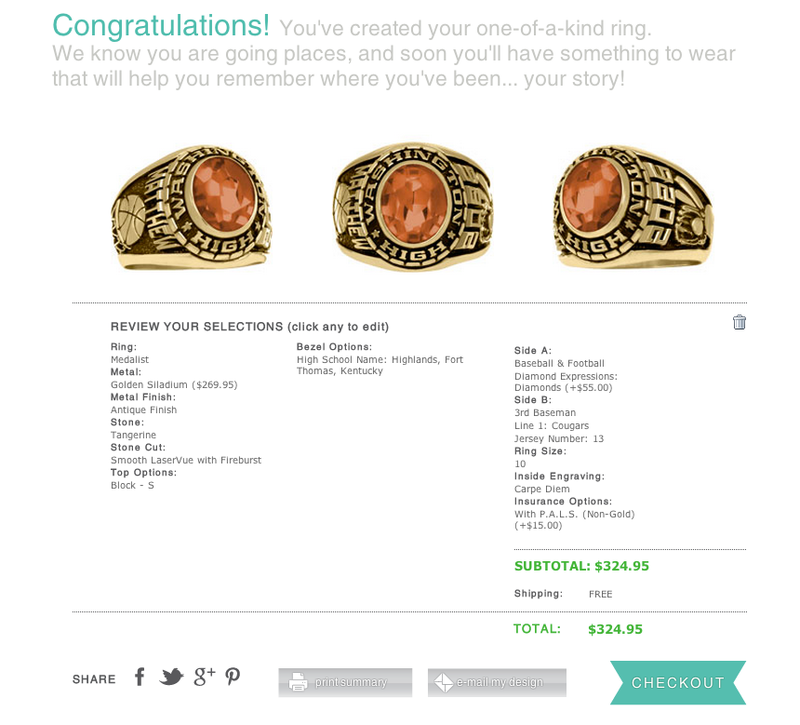 And therefore, the site was not custom created to assist students in building their class ring. We found sites with horrible design that made you just want to throw up a little from being on the site. But most of all, we just found sites that were complex, confusing, outdated, and just made us angry. We decided to change that by building a website that was simple, intuitive and pleasing to the eye. We feel we’ve accomplished that mission. Our site is 100% dedicated to high school class rings and allowing our users to create the perfect personalized ring for them. So, you will notice our navigation is very clear and very simple. Read on below for detailed information on how to build your class ring, and watch our video to see how easy it is to create your ring at Wear My Story. Our simple, intuitive design begins on the home page. 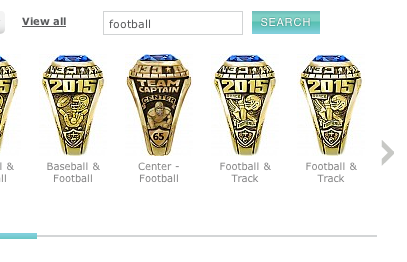 On our home page, you can view all high school rings for girls and guys. You can also view different metal types (yellow or white) and stone colors. You also know the baseline price for each ring, so you know from scanning through the different ring styles what rings are in your price range. We offer over 30 different ring styles to choose from, including traditional class ring looks as well as fresh and modern fashions to choose from. 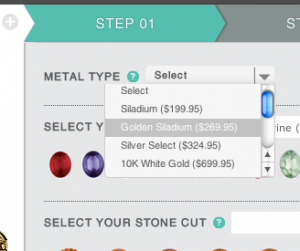 Once you’ve decided on your ring style, simply click the personalize button to get started crafting your custom ring. Depending on your ring style, our ring configurator will launch and you will have 1-3 steps to complete to design your ring. One of our most popular ring styles is the Men’s Medalist. We’ll walk you through the details of each step so you are comfortable using our website to design your ring. For this ring, Step 01 of designing your ring includes selecting your Metal Type, Metal Finish, Stone Color, Stone Cut and your Bezel Options. Our ring metals include Siladium (a fine jeweler’s stainless steel with 12% nickel), Golden Siladium, Sterling Silver, 10k White and Yellow Gold, 14K White and Yellow Gold and 18k White and Yellow Gold. What’s nice about this first drop down menu on Step 01 is that you can clearly see all of the baseline ring prices upfront. You won’t waste precious time building a ring and not knowing the cost of your ring. And speaking of pricing, we offer the guaranteed lowest prices online for all ArtCarved rings. If you find the same ring on another website, we will beat that price. The next step is your metal finish. You have the option of selecting either an Antique or Natural finish. If you don’t know what that means, simply click the question mark symbol next to the drop down menu. These question marks are conveniently placed throughout the ring configurator to answer any questions you may have about designing your ring. In this case, you learn that an Antique finish provides a dark background for your ring which helps your personalization really pop. If the pop up message doesn’t provide the answer you are looking for, you can also search or FAQ page or contact us. The next step is choosing your stone color. We offer stone colors in every birth stone (Garnet, Amethyst, Aquamarine, Emerald, Ruby, Peridot, Topaz, etc. ), with a few additional options like Black Onyx, Fire Blue Spinel and Tangerine. After choosing your stone color, it’s time to select your stone cut. The stone cut is another fun way to make your ring unique. Our site allows you to see what the stone cut will look like with every stone color, so be sure to take advantage of that feature. On many ring sites, you have to take a stab in the dark to know what your stone cut might look like. You also have the ability to enhance your stone here with a LaserVue or Encrusting option. The LaserVue is under the stone and is free. The Encrusting images are added on top of your stone to make a bold statement. Choose from 100s of images including mascots, numbers, letters and other options. The final selection on Step 01 is select your bezel. I know, it sounds weird, but the bezel is simply the wording around your stone on the top part of your ring. For the Medalist ring, you have 3 options to choose from – your high school name, home school options, or a custom bezel. Most students will select their high school, which will have your high school and mascot name (we have this information on file). But, for an extra unique ring, you can craft your message around your stone. The cost is $99 to add a custom bezel up to 40 characters. When all options are selected, the grey Continue button will turn to teal. Ok, onto Step 02. This isn’t too hard, right? I promise that using the site itself is much more fun than reading a blog post and looking at screenshots! And it starts getting more fun right here, because this is where you get to select your side emblems, aka the images on the side of your ring. For many people, when building their class ring, this is the most exciting part. While there are many places on the ring you get to creatively personalize, the side emblems could be considered the most visible component of your custom ring. Again, we’ve worked hard to make this part of the personalization process smooth sailing for our customers. Whether buying a class ring in school or on most online sites, this portion of creating your ring could be the most frustrating. Why? There can literally be over 500 side emblems to choose from, and most brochures or websites do a horrible job of presenting these options. On our site, you can sort through the different side emblems multiple ways. First, there is a scroll bar where you can simply scroll through the images one at a time. Around image number 237, you might get a little tired. The next way you can search is to narrow by category. Simply, click the category drop down menu and select the category where you believe your design will be. You can also type in a search phrase to find your side emblem. If that phrase is in the emblem’s title, it will show up when you click the Search button. In the example below, I searched for the phrase “football”, and all of my options appeared in an easy to navigate menu. The final way to search through all of the side emblems is to click the View all link. This will open a new tab in your browser where you can quickly and easily see all of the different side emblem designs. You can sort by category, use the search bar, and hover over the image to see a larger picture of the design itself. Once you’ve selected your side design, it’s time to personalize your engraving. This is the area above the side emblem and below the bezel. For this ring, you have 3 options to choose from. You can add 1 or 2 lines of custom text, each with a total of 9 characters. The first line is free, but it is $20 extra to add a second line of custom text. Or, you can choose your graduation year. All current graduation years are free, but backdate graduation years are also an additional $20. Finally, you could choose to add Diamond Expressions above your emblem. This is an opportunity to add a bit of bling on the side of your ring. To add diamonds here, there is an $55 charge, and you have 4 designs to choose from. If you’ve selected a side design that has space for your jersey number below the emblem, you will also have to enter your number. Select your side emblem and engraving for Side A, and then don’t forget to do the same for Side B! Now, that you’ve taken care of both sides of your ring, click the teal Continue button and it’s on to Step 03! The final piece to creating your one of a kind ring is Step 03. On this page of the ring configurator, you have just a few items to take care of – Ring Size, Inside Engraving and Insurance Options. Choosing your ring size when designing your ring online is an important part that merits a bit of discussion. Now, there are plenty of online ring sizers you can download, print off and measure your ring. If you feel comfortable with that, you can go ahead and use that method. However, we strongly recommend that you get your finger sized at a local jeweler. You are going to get a more accurate measurement, and you feel the difference in ring sizes with a ring sizer as opposed to a piece of paper. Plus, jewelry stores should be easily accessible. We even have one in our local Kroger grocery store! It’s worth the little bit of extra effort to get this right so you don’t have to send your ring back to get resized. But, the good news is if you do need to send your ring back to get resized, we’ll do it for free! The inside engraving is one extra space on your ring where you can design in your unique story. We offer up to 18 characters of inside personalization for FREE! Be sure to take advantage of this. What’s great about this space is that no one else will see what it says unless you take your ring off your finger. So, this can be a bit more of a secretive message that you want custom engraved onto your ring. The final step is your insurance options. Since we offer ArtCarved rings, you can select from their P.A.L.S. Replacement Agreement options. All of our rings come with a FREE Lifetime Warranty. This includes any defects in the ring, resizing your ring up to 2 sizes, and cleaning and polishing your ring. The P.A.L.S. Agreement covers you if your ring is lost or stolen. This Protection Against Lost or Stolen Replacement Agreement gives you some piece of mind. It’s only $15 for non-gold rings and $25 for gold rings. If your ring is lost or stolen, your ring will be replaced for a minimum cost of the original price of the ring, ie. $50 for non-gold rings. So, if your the person who can never find their wallet or keys, then you might want to consider this option as a safety precaution. After all, you’ve invested a lot to get this class ring, and this agreement helps you protect that investment. Once you’ve chosen your final options, click the Add to Cart button to review your selections. On this page, you get to see the top, left, and right angles of your ring complete with metal color and stone color. You also get a list of all of your personalized selections. Be sure to double check everything! If any changes need to be made, you can simply click on that item and the configurator will re-open for you to make your necessary changes. If you have a discount, make sure it is applied. And notice that we offer FREE SHIPPING on all of our rings. So, you don’t have to worry about any extra cost there. If you want to share your ring design to the world, click on the share buttons. And, if you need to save your ring design and come back later to purchase your ring, make sure you have created your account. When you log back in, all of your selections will remain in tact. Proceed to checkout, and you will get your ring in 4-6 weeks!!! Ok, we are coming down the home stretch. Are you tired yet? Well, we’ll do a quick sprint to the end. The last item we want to cover in this guide is overcoming any objections you may experience when considering buying a class ring online. Here are a few of the most common we have observed. Trust – Can I trust this company? That certainly is a question that needs to be answered before buying your ring. On any website, be sure to check out any testimonials or any hints that make you feel a bit sketchy. At WearMyStory.com, we are a member of the BBB, and you can check our A rating and our history of serving our customers. Quality – Will my ring be the same quality as if I ordered it in school? Another great question to ask! Many websites sell rings that aren’t high quality, and that is how they can get away with lower prices. Or, you might not have complete personalization options. Not so with us. We offer ArtCarved rings, which is a company that has been making class rings for nearly 100 years. Basically, ArtCarved is a sister company to Balfour and offers the online version of their class rings from the parent company of Commemorative Brands, Inc. We’ve been working with this company for ove 10 years. They make excellent, quality rings, and we offer them to you at the lowest prices on the web. 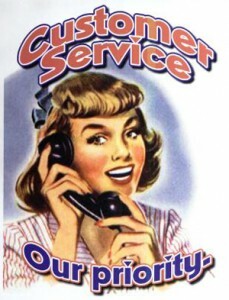 Customer Service – What if I have questions? What if I need help? This is another fear that customers have while shopping online. And it’s legit. You need to know if you are going to get help when you need it. At WearMyStory.com, you can call us at any time day or night. Contact us, and we’ll be there to serve you any way we can. We love high school students, and we are proud to help them receive one of these cherished gifts to remember the great times of high school. So there it is. If you made it to the end, CONGRATULATIONS, you are a gamer. Now you have everything you need to know about designing and creating your one of a kind unique story of a class ring online. If you have any questions, feel free to reach out to us. We love hearing from you, and we hope this was helpful! I would like to replace my collage ring my collage has closed can you help??? I would like to replace my collage ring but the collage closed is there something you can help me with? 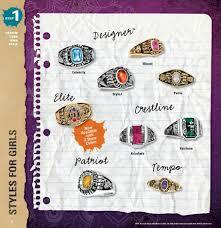 Your tips are really very helpful to design a best class ring!! So nice. Keep posting.. I graduated in 1970 from East Bank Senior High School in WVa. The school has now closed and consolidated with another. Some one stole my class ring and I would like to get another one to replace it. How do I go about getting one like the one that was stolen. Our mascot was the Pioneers. We had the option of a cigar band type ring or a ring with the blue stone and Mine had the blue stone.